Since 1974 GCR Eurodraw has been designing, developinig and manufacturing equipment, process lines and complete plants for the steel wire industry. 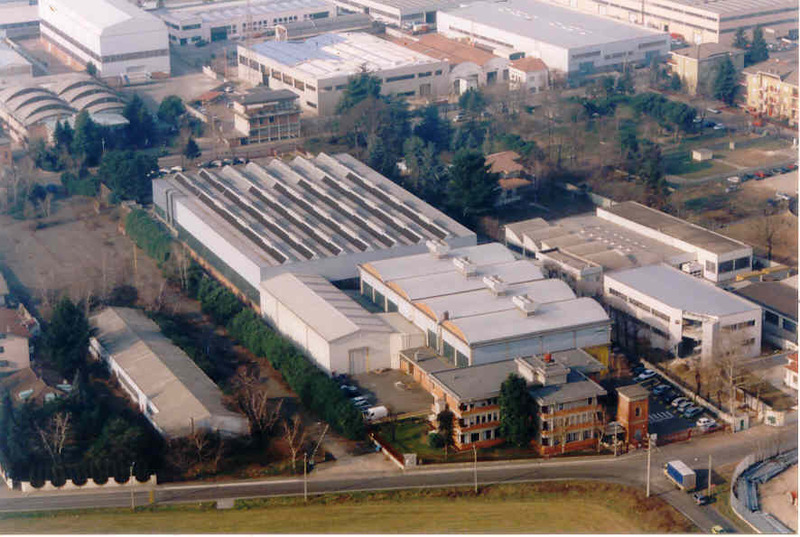 The premises occupy 13.000 sqm of which 7000 sqm are dedicated to production and 2500 sqm are office area, in Pogliano Milanese, close to Milan. Eurodraw Wire Equipment has its own liaison and service offices in the United States of America and is represented by Agents in many countries throughout the world. The Company was established in 1974 with the name GCR Engineering SpA, as an associate of the GCR Group. Development continued with the acquisition of prestigious trademarks such as MILL and OZ Cams and was further extended when Eurodraw Srl was set up in 1989 became a leading company in the field of machinery for the steel wire industry. In January 2002, a deed of incorporation was stipulated and GCR Engineering SPA merged with its subsidiary Eurodraw Srl and assumed the company name of GCR Eurodraw SpA and in 2015 Eurodraw Wire Equipment srl. The merger was decided in order to optimize the management of resources and offer complete and integrated service to customers. The first industrial initiative of the original GCR Group in the steel cord field was the acquisition of Riva & Co. in Turin in 1965, a company specializing in the production of bead wire and bright wire for steel cord, which is the special brass-plated strand used to reinforce the structure of radial tires. Nowadays, Eurodraw Wire Equipment supplies high-technology machines all over the world, not only for production of "steel cord", but also for many different applications of steel wire and cord in general. Eurodraw Wire Equipment can provide technical and technological advisory services, technical-economical-financing feasibility studies, production technologies, instruction and training of personnel, supervision of plant installation and start-up, as well as technical assistance and consulting for management of production quality. The Company has a very high business volume and potential in relation to its size which is due to its dynamic and flexible structure. In fact, Eurodraw Wire Equipment has chosen to operate with a restricted, selected and highly specialized staff of technologists, designers and experts all of whom are highly experienced, not only in the design and manufacture of plants and machines, but also in the technological management of production plants. All the design work is carried out within the Company, but with the help of consultants who are expert in the study and application of advanced technical solutions for the industrial mechanics and electronics sectors. Machinery and line units are assembled at the production facility, while manufacture of the components is entrusted to specialized workshops connected to Eurodraw Wire Equipment itself where production is directly coordinated and supervised. Mechanical groups and special parts, electronic systems and instruments are purchased from Italian and foreign suppliers, all of whom are leaders in their fields of activity. In addition to using the most updated technological solutions following a constant process of research and development, design is aimed at ensuring operational efficiency of the product as well as ease of use and maintenance. Manufacture and supply of commercial components are strictly controlled to guarantee consistent standards of the highest quality. From the beginning, GCR Eurodraw directly realized important industrial installations both for the original GCR group and for international customers. GCR Eurodraw has installed complete plants throughout the world: In Sardinia, Italy, General Cable Riva in Cagliari for the production of steel cord, bead wire and bright wire (the present Bridgestone Metalpha Italia, which was taken over by the Japanese Bridgestone and subsequently by Bekaert). In Northern Italy, in the Milan area, RIVA STEEL, for production of steel cord and hose wire, more recently sold to the South African group Haggie Rand. In Austria, STAHLCORD, a steel cord factory, taken over by Trefilarbed Bettembourg of the Arcelor Group. In the USA, AMERCORD, which originated from a joint-venture between the Canadian Group IVACO, the American ASSOCIATED MATERIALS INC., and GCR itself, in order to renew the equipment, update the technology and expand the production of steel cord of the former COOK & Co., located in Georgia, USA. Our success in the field of complete plants is not only due to the technology that Eurodraw Wire Equipment can provide. It is also due to the fact that on the international market in the steel cord field it is hard to find a company that can provide - all in one - services, technology, machines and training of personnel. It is also hard to find a company that has first tried out, tested and set up machines and technology in its own factories and in those of its associates and customers; and with whom there is strict cooperation and constant feedback. For many years, GCR Eurodraw has been supplying leading companies such as Michelin, Goodyear, Bridgestone, Sumitomo and Pirelli with machines and lines for the production of steel cord. In fact, very few steel cord plants in the world have NOT been supplied with GCR Eurodraw machines and/or services. A remarkable number of complete plants has been set up in the People's Republic of China, where investments in the steel cord field have privileged Eurodraw Wire Equipment technology in the realization of complete plants and processing lines. Furthermore, Eurodraw Wire Equipment specializes in many other sectors involving machines and lines suitable for production of steel wire and cord for diverse applications, such as: belt cord for conveyor belts, hose wire for high pressure and special hydraulic hoses, tire bead wire, wire for bearings, wire for electrodes and for welding, spring wire, staple wire; wire for special applications, with or without metal coating (copper, zinc, brass, bronze, nickel, tin and so on); bare and zinc-plated steel and stainless steel strands; cables for bicycles, motorcycles and automobiles, and for nautical and aeronautical applications; P.C. wire and P.C. strand and others. All these products are supplied worldwide. Our continuing efforts towards improvement and to the study and implementation of new technological solutions and processes, supported by the feedback of customers and suppliers, ensure that we will continue to maintain a leading position in the market with a commitment to total quality. This commitment led to ISO 9001 Quality Control Certification by TÜV Management Service in 1999, which was requalified to VISION 2000 Certification IN 2002 and has now been renewed to 2016. С 1974 года компания «GCR Eurodraw» проектирует, разрабатывает и производит оборудование, технологические линии и комплексные установки для изготовления стальной проволоки. На территории компании в 13000 кв.м в Польяно Миланезе, округ Милана, 7000 кв.м занимают производственные площади и 2500 кв.м – офисы. «Eurodraw Wire Equipment» располагает собственными офисами связи и сервисами в Соединенных Штатах Америки и агентствами, представляющими компанию во многих странах по всему миру. Компания была основана в 1974 г. под именем GCR Engineering SpA, как аффилированная структура GCR Group. Дальнейшее развитие продолжило приобретение таких престижных торговых марок, как MILL и OZ Cams, а затем и основание «Eurodraw Srl» в 1989 году, которая стала лидирующей в сфере производства оборудования для изготовления стальной проволоки. В январе 2002 г. был зарегистрирован учредительный договор, и «GCR Engineering SPA» объединилась со своей дочерней компанией «Eurodraw Srl», получив название «GCR Eurodraw SpA», а в 2015 – «Eurodraw Wire Equipment srl». Решение о слиянии было принято с целью оптимизировать управление ресурсами и предлагать своим клиентам полный комплекс услуг. Инициативным шагом со стороны первоначальной структуры «GCR Group» в области производства металлокорда стало приобретение компании «Riva & Co.» в Турине в 1965 г. – компании, специализирующейся на производстве бортовой проволоки и светлой проволоки для металлокорда, то есть специальной латунированной нити, которая используется для укрепления структуры радиальных шин. В настоящее время «Eurodraw Wire Equipment» поставляет высокотехнологичное оборудование по всему миру, и не только для производства "металлокорда", но и в целом для различных видов применения стальной проволоки и корда. «Eurodraw Wire Equipment» предоставляют технические и технологические консультационные услуги, ТЭО, производственные технологии, инструктаж и обучение персонала, шефмонтаж оборудования на заводе и запуск в эксплуатацию, а также техническую помощь и консультации по управлению качеством продукции. Хорошие объемы бизнеса и высокий потенциал, учитывая размер компании, обусловлены ее динамичностью и гибкой структурой. Фактически, «Eurodraw Wire Equipment» сделали ставку на работу с ограниченным кругом отобранных и узких специалистов, технологов, проектировщиков и экспертов с большим опытом работы не только в проектировании и производстве установок и оборудования, но и в технологическом управлении производственными линиями. Все проектные работы ведутся в рамках компании, с привлечением консультантов-экспертов в изучении и применении передовых технических решений в секторах промышленной механики и электроники. Сборка машин и модулей технологических линий происходит на производственном объекте, а изготовление компонентов отдано специализированным мастерским, связанным с «Eurodraw Wire Equipment», где непосредственно и осуществляются координирование и контроль производства. Механические группы и специальные детали, электронные системы и инструменты закупаются у итальянских и зарубежных поставщиков. Все поставщики являются лидерами в своих областях деятельности. Помимо использования наиболее современных технологических решений вслед за постоянным процессом исследований и разработок, проектирование нацелено на обеспечение эффективности продукта, а также простоты в эксплуатации и техобслуживании. Производство и поставка коммерческих компонентов строго контролируются, чтобы гарантировать постоянное соответствие стандартам самого высокого качества. С самого начала «GCR Eurodraw» реализовывали важные промышленные проекты как первоначально для группы компаний «GCR group», так и для международных заказчиков. «GCR Eurodraw» установили комплексные производственные объекты по всему миру: в Сардинии, Италия, General Cable Riva в Кальяри по производству металлокорда, бортовой проволоки и светлой проволоки (на сегодняшний день компания «Bridgestone Metalpha Italia», которую поглотила японская фирма «Bridgestone», а впоследствии «Bekaert»). В Северной Италии, в районе Милана, компания RIVA STEEL по производству металлокорда и гибких металлических шлангов, которая совсем недавно была продана Южно-Африканской группе компаний «Haggie Rand». В Австрии «STAHLCORD», завод стального корда, приобрели «Trefilarbed Bettembourg» концерна «Arcelor Group». «AMERCORD» в США возникла из совместного предприятия канадской группы компаний «IVACO», американской корпорации «ASSOCIATED MATERIALS INC.» и самой «GCR», с целью модернизации оборудования, технологий и расширения производства металлокорда бывшего «COOK & Co.», штат Джорджия, США. Наш успех в реализации комплексных производственных объектов обусловлен не только технологией, которую могут предоставить «Eurodraw Wire Equipment», но и тем фактом, что на международном рынке в нише металлокорда сложно найти компанию, которая может обеспечить «все вместе» - услуги, технологии, машины и обучение персонала. Кроме того, нелегко и найти компанию, которая первой опробовала, испытала и установила оборудование и технологии на своих собственных заводах, в аффилированных производственных структурах и у клиентов; а также обеспечивающей четкое взаимодействие и постоянную обратную связь. В течение многих лет «GCR Eurodraw» являются поставщиками машин и линий производства металлокорда таких компаний-лидеров, как «Michelin», «Goodyear», «Bridgestone», «Sumitomo» и «Pirelli». Фактически, лишь очень немногие заводы по производству металлокорда в мире НЕ приобретали машины и/или услуги от «GCR Eurodraw». Значительное число комплексных установок осуществлено в Китайской Народной Республике, где инвестиции в сектор производства металлокорда получили льготы в части технологий «Eurodraw Wire Equipment» при внедрении комплексных установок и линий переработки. Кроме того, «Eurodraw Wire Equipment» специализируются и во многих других отраслях, включая машины и технологические линии для производства стальной проволоки и корда различных сфер применения, таких как: тросы для армирования конвейерных лент, гибких металлических шлангов высокого давления и специальных гидравлических шлангов, бортовая проволока шин, нить для армирования подшипников, электродная проволока и проволока для сварки, пружинная проволока, скобяная проволока; проволоки специального назначения, как с, так и без металлического покрытия (медью, цинком, латунью, бронзой, никелем, оловом и так далее); стренги – оголенные и оцинкованные стальные и из нержавеющей стали; замки для велосипедов, мотоциклов и автомобилей, а также для применения в морской и авиационной навигации; арматурные жилы и тросы для железобетона и др. Вся эта продукция поставляется по всему миру. Наши постоянные шаги к совершенствованию, изучению и внедрению новых технологических решений и процессов при поддержке наших клиентов и поставщиков гарантируют, что мы и впредь будем сохранять лидирующие позиции на рынке, обязуясь поддерживать общий уровень качества. Это обязательство и привело к сертификации по системе ISO 9001 Контроль качества службой «TÜV Management Service» в 1999 году. Затем данный сертификат был подтвержден и VISION 2000 Certification в 2002 году и продлен в 2016.